Sofi Hamid Cemetery is the most unique graveyard that we know of - not just in Azerbaijan, but any place in the world. No exaggeration. The practice of choosing meaningful symbols to represent one's life, carving them on gravestones and painting them in pastel colors seems to us to be extremely rare. Like all cemeteries, Sofi Hamid is a repository of thoughts and attitudes regarding death. It is like an open history book begging to be read. There, in a very concentrated form spread out over a few acres on a wind-swept desert plain in Azerbaijan is documentation of the trends and transitions related to folk beliefs, religion, nationalism, politics, economy, education, and even language and alphabet usage, that have taken place over the centuries. Left: Sofi Hamid Cemetery is located about 45 minutes southwest of Baku off Alag Highway beyond Sangachal Terminal and Umbaku in what might appear to be "the middle of nowhere" on a wide, wind-swept plain. No village or town is within sight. The gravestones are characterized by carvings of objects that were meaningful in the life of the person who passed away. The symbols and scenes are carved out on limestone and painted, usually in pastel colors, primarily blue, green, pink and yellow. Note here the arrangement of fruit carved in stone on top of the grave. Typically, apples, pears, grapes and pomegranates are part of the display of fruit. In this sense, Sofi Hamid is a paradise for folklorists. Studying the graves provides incredible insight into the belief systems in the region. And yet the reality is that no folklorists have published any analysis about this place. We wondered why such a vast treasury had been overlooked or neglected by social scientists. The answer, we learned, was simple: Sofi Hamid touched on two areas that were forbidden for investigation during the Soviet period. And since independence, very little field work has officially been carried out because of the lack of funding. During the Soviet period, topics that delved into the influence of nationalism and religion, specifically pan-Turkism and pan-Islamism, were left untouched. During Stalin's era, several folklorists lost their lives for investigating such issues. So, in essence, Sofi Hamid became forbidden territory for academic research. Of course, it was possible to visit the cemetery. But generally, scientists knew that they would not be able to advance their careers if they tried to grapple with such topics. And thus, self censorship became the norm. Truly, it is impossible to do a proper analysis of Sofi Hamid except in the framework of Islam and nationalism. This is not to say that at Sofi Hamid you won't discover a hodge podge of beliefs as you wander amidst the several thousand gravestones. Here you'll find an unusual and unpredictable blend of folk beliefs - animism, communism, Shia Islam and more. To our knowledge, this is the first time that any article has ever been published about Sofi Hamid in any language - Azeri, Russian or English. We hope our work will encourage others - both Azerbaijanis and foreigners - to follow with an even deeper analysis. One's first impression about Sofi Hamid is that it is a delightful open-air museum - full of symbols, carved out in stone - often a bit primitive in the execution of their design - and painted in pastel colors. Sofi Hamid represents a triumph of personality and individuality. And it can be sincerely enjoyed and appreciated on this level. A stroll through the cemetery is a bit like going on a Treasure Hunt as you try to answer questions such as: Who was this person? What does this symbol or object represent? Why is that person represented in this way? Sofi Hamid is a unique place for many reasons. It does not resemble any other cemetery in Azerbaijan, as there is a juxtaposition of so many trends and styles incorporating ethnographic, religious and even communist motifs. All of them are the production of folk culture and fantasy. During the Soviet period, Communist rule weakened the traditional religious Islamic framework and encouraged folk fantasy and national culture to reveal itself in this funereal art. One of the major defining characteristics of Azerbaijan's history this past century was the reversal of political systems that took place over and over again. Again, this is evident here in the cemetery and becomes one of its most defining characteristics. The pre-Soviet era (prior to 1920) was defined by Islam. By the 1930s, with the Soviets in firm control, many of the mosques and cathedrals were dynamited. Efforts to establish an atheistic state were put into motion. For example, two of Baku's most prominent places of worship - Bibi Heybat Mosque and the Alexander Nevski Russian Orthodox Cathedral - were both demolished in the early 1930s. Despite the official stance against religion, Sofi Hamid proves that ambivalence about religion continued to persist in society. There are many graves that provide evidence of belief in God during the Soviet period. To understand the phenomenon of Sofi Hamid, it is important to analyze the graves at Sofi Hamid within the context of Islamic beliefs related to death and burial. Islam discourages memorializing the corpse after death. It holds that the grave is only a temporary sanctuary for the human body in this "Fani Dunya" (ephemeral, temporary, material world). When a person dies, his soul passes on to the next World. All remnants of this existence here on earth, including the grave itself, must be allowed to disintegrate and gradually disappear. According to Islamic law, graves must be modest and the gravestone should not be very large. Traditionally, the grave is marked by a large rock (about one meter in height) on which the name of the deceased is identified, along with dates of his birth and death. Often a few verses from the Quran are inscribed on the grave. As is true in most societies, it is the closest relatives that continue to visit the graves of their loved ones. Sometimes, grandchildren continue this practice but, invariably, the following generation tends to forget and the grave is left abandoned. From the Islamic point of view, this process is natural and right. Islam does not encourage the maintenance of the grave too long. Within a few generations, the soil that has been dug and heaped up over the grave must sink in and become level with the ground again. Construction of ornate gravestones, burial tombs or luxurious mausoleums is considered to be a sin of arrogance or pride. This is not to suggest that Muslim rulers did not built elaborate burial sites. Ample evidence exists indicating that kings in the Middle Ages did construct ornate mausoleums for themselves and family members. For example, the 12th century grand mausoleum for Princess Momina Khatun in Nakhchivan (Azerbaijan) or the Taj Mahal Mausoleum in Agra (India) are well known examples of such trends among medieval Muslim monarchs. However, these exceptions were characteristic of royalty or totalitarian despots, not average citizens. In general, cemeteries for ordinary people adhered strictly to Islamic law. Prior to the Soviet period, nearly all cemeteries in Azerbaijan were quite modest in appearance. Such traditional cemeteries still exist in Azerbaijan. They look like an open field with many gravestones, in various states of disintegration - some are new; others show evidence of age with lichen growing atop or wild bushes of the camel thorn and tumbleweed nearby. Some are beginning to sink into the ground, lean to one side, or fall over. The ornamentation and inscription are nearly illegible, having become eroded by natural elements - wind and water. So, in such Muslim cemeteries, you might say that you can distinguish between the "generations" of grave stones: (1) the straight, tall, "youth" represented by light, cream-colored stone recently hewn from local quarries, (2) the gray and slightly eroded gravestones of "middle ages", (3) darkened gravestones and lop-sided "elders", (4) lame "centenarians" and finally, the (5) "dead graves" which have mostly disappeared underneath the ground. Things are somewhat different at Sofi Hamid. First of all, many gravestones are painted in pastel colors, especially blue, green and yellow. Some gravestones are multi-colored, sometimes even resembling tropical African art. Even some of the very old gravestones still have traces of color. These characteristics predate communism and seem to be influenced by ethnographical characteristics of the local population. At Sofi Hamid, objects are carved out on the various sides of the gravestone and head stone that relate to the gender, interests or profession of the deceased. For example, it may be a rifle if this person were a hunter, a ship for a sailor, a bus for a driver. Sofi Hamid is unique in that the depiction of images of both humans and animals is not typical in Muslim cemeteries. In Islamic art, only plant ornamentation (images of flowers, herbs and trees) is permitted. It is true that images of humans and animals do exist in Islamic art, such as the illustrated miniatures in books of the Middle Ages. However, such depiction was possible only in books. Sculptures depicting humans or animals were strictly forbidden because they were considered to be akin to idols of the pagan religions. Therefore, carving images of humans or animal on sculptures was equivalent to rejecting Islam and pursuing pagan belief. During the Middle Ages, such a person could be declared "murtad" (apostate) and sentenced to death. Depiction of human images, including photographs or etchings on gravestones, is not permitted in Islam. The grave was considered the final sanctuary or resting place for the human body. According to Islam, on the Judgment Day, all those who are dead will be resurrected and will rise up out of their graves to be in the presence of God to answer for their sins. But graves at Sofi Hamid often include photos of the face of the deceased person. There are even black headstones, characteristic of the Soviet period that began just before Gorbachev's era (around 1980s), where an entire full-length view of the person, front and back, is etched out. Such photographs are not confined only to Sofi Hamid. Though statues or carvings of animal life are forbidden in Islam, you'll find many carvings of animals at Sofi Hamid. For example, there are many scenes of camels, usually portrayed in caravans. Azerbaijan served as a crossroads for trade routes between east and west, as well as north and south and transportation via camels was very common. The very existence of Sofi Hamid as a place of holy pilgrimage has its roots in the use of camels as a mode of transportation. Sofi Hamid, according to the stories that circulate today, was an Arabian merchant in the 14th century who visited the region, more or less, like an itinerate mullah. As the story goes, when Sofi Hamid realized that he was dying, he instructed his traveling companions to bury him where his camel would come to rest. And thus, camels are often featured as a great part of the iconography on the gravestones there. Also, camels provided the primary mode of transportation for Muslims on pilgrimages to Mecca. Not only are camels depicted on the graves, but inside the courtyard where the Pir (sepulcher) of Sofi Hamid is located is a stone statue of a camel. Folk practices have grown up around the statue. For example, if a woman cannot become pregnant, it is believed that if she crawls under the belly of the camel, she will become fertile. She should repeat this three times for it to be effective. In addition to camels, you'll find many depictions of horses on the graves. They are depicted with saddles or hitched to covered carriages. There are also scenes of nature, which feature animals such as mountain deer or pastoral scenes with sheep. You'll also find an occasional cow. Also pairs of lovebirds can be found on gravestones especially if the person died at an age that people associate with weddings more than with funerals. Worshipping snakes dates to pre-Islamic times in Azerbaijan. Such animistic beliefs were held by ancient Caucasian Albanians and medieval Turks. In pre-Islamic times, the snake was a totem of some ancient tribes. Pictures of snakes and dragons were featured on the flags of ancient Turks. Many villagers still consider snakes to be sacred creatures. The influence of ancient legends is still evident at Sofi Hamid. Superstitions pre-dating Islamic beliefs still exist among the local population. For example, people living in the vicinity of Sofi Hamid consider snakes to be sacred. They believe that no snake will harm them on the cemetery grounds if they are pure. For good measure, they often take a handful of earth from Sofi Hamid to their own residence to ward off snakes. There are even carvings of snakes depicted on gravestones. We were so surprised to see such an image portrayed. Our first thoughts were, «Poor man, he must have died of a snake bite». But a closer look showed the snake being offered what appears to be a small bowl of milk. Was this venom that someone had milked from the snake? Was this person a caretaker of snakes? There used to be a snake farm on the Absheron Peninsula where vipers were raised for therapeutic uses of venom. When we inquired of one of the stone carvers what the meaning of snakes carved on the tombstones indicated, he told us that it simply meant that that person was not afraid of snakes; and that he was perceived as being extremely kind and gentle, to the extent that, at least, metaphorically, snakes would eat out of his hand. In Azerbaijani folk tales such as "Beautiful Fatma", "Hunter Pirim" and "Wood Sword", we can see traces of ancient animistic beliefs where snakes and such creations are portrayed in a positive light. At Sofi Hamid, one might expect that with thousands of graves, each one would be different. Well, of course, there is some variation in the execution of the many designs; after all, there are six surfaces on the gravestone that must be designed - front and back of the headstone, plus the four sides and the top table surface of the gravestone itself. So, you might say that there are six canvases that the artist must fill in a cogent and related manner. It's no wonder that many symbols are repeated. One of the stone carvers told us that people usually look at the other carvings on the graves and choose from them what they would like for their own. For example, during the mid-20th century, many of the graves of women, depict a simple sewing machine and necklace and earrings. Of course, the carvings can be expressed differently, but the content is often quite the same. There seems to be more variety on men's graves, than on women's. But this may only reflect that more options were open for careers for men, and that women were more closely associated with the home. You don't have to know Azeri, Russian or Arabic to glean enormous meaning from a visit to Sofi Hamid. However, taking someone with you who knows some of these languages will make your visit more meaningful and help you understand it more deeply. The typical grave in Azerbaijan features inscriptions and prayers from the Quran. But at Sofi Hamid, you'll also find secular inscriptions that can be traced to medieval Azerbaijani or Eastern poets, such as Nizami Ganjavi, Hafiz of Shiraz, and Omar Khayyam. Friends or relatives, especially parents or children of the deceased often author these lines. Typically, they are in the Azerbaijani language, and may be written in Cyrillic, Latin or even Arabic scripts. Some verses glorify the most exemplary characteristics of the person who has died. Other verses may be reflective and philosophical about the transience of life or they may express regret that life has been snuffed out or that a person's fate met such a tragic end. Inscriptions related to Islam are invariably chiseled out in Arabic, though at Sofi Hamid, the Arabic is often very poorly written and misspellings are frequent. Typical expressions from Islam include verses from the Quran such as: "There is no God but Allah, and Mohammad is his Prophet", or expressions such as: "May God rest his soul". He has neither parents, nor children. Forgive me for the sake of Quran. For the sake of Mohammed, the Prophet! Welcome to your house after death. Welcome on your journey to the land of justice. At Sofi Hamid, however, you find a broad variety of verse that reject the notion of anticipating the Afterlife. Instead, they complain about death snatching them away, especially if death was untimely or brought on by an accident or tragedy. Such notions would not be permitted if Islam were strictly followed. For example, we came across a section of five related graves (a mother and her four daughters), who obviously had met tragic deaths on the same day - November 15, 1986. Each of the graves had inscriptions and poems on them, though none reveals the actual unfortunate circumstances that took their lives. The Angel closed my eyes. I could not utter any protest. Beside my lovely daughters, mourn. So little had I sought their care. Our fate was too dreadful. May those who visit my grave mourn. The heart of the angel became stone. My mother and sisters surround me. Barely had I seen enough of my father and mother. I did not know that my fate would be so unlucky. Would one day destroy everything. Here I learned that this world is fake. It takes back the things that it gives. I've seen how fate has ruined everything. And made most people to suffer. No doctor can save us from this disease. Everyone who comes into this world will leave it this way. You burned me like a fire. My light has gone out. Many of the monuments at Sofi Hamid were erected during the Soviet times and reflect the Soviet style. Since USSR was officially an atheist state, it introduced an atheist communist ideology and secular culture in Azerbaijan. 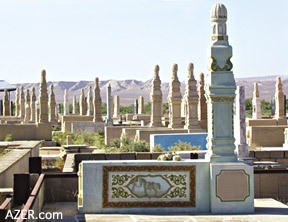 Sofi Hamid Cemetery bears witness that the influence of Islam declined during this period. The Soviets encouraged the cult of personality and leaders. They went out of their way to honor and distinguish individuals who they considered to be "heroes of labor", the peasants and workers. Commemoration of these outstanding personalities is evident in sculptures, burial monuments and tombs. The impact of such ideology is seen in Muslim cemeteries in Azerbaijan as well. Instead of modest gravestones carved from limestone, the graves took the shape of tall pedestals capped with a Soviet five-pointed star and a photo of the deceased person and symbols related to his work or career. The cult of the material world is typical of Soviet ideology. Communists did not believe in the soul or existence in a world that followed. However, they claimed that "good communists" after death live eternally in the memories of those left behind. One of the most popular slogans during the Soviet period declared: "Lenin is always alive! Lenin is always with us!" The Mausoleum of Lenin in Moscow with his mummified body on display reflects the aspiration of Bolsheviks to create their own religion without God and without belief in the Next World. Lenin was their prophet and "Kapital" by Karl Marx was their Bible. Not only Lenin and Stalin, but it became possible for all citizens throughout the entire Soviet Union to be commemorated after death. Every peasant or worker was permitted to erect a sculpture or beautiful tomb in honor of relatives who had passed away. Therefore, it was at this time that Sofi Hamid cemetery turned into an art gallery. Sofi Hamid also provides considerable insight into the delay between official policy and acceptance in folk psyche. Take alphabet and language usage, for example. In the 20th century, the alphabet was officially changed four times in Azerbaijan: from Arabic to Latin (1929), to Cyrillic (1939), and back again to a modified Latin script (late 1991). [Search AZER.com: Entire issue: «Alphabet and Language in Transition», AI 8.1, Spring 2000]. It takes time - often years - for language policy to take effect. People need time to learn and and feel comfortable with new scripts. Age becomes a major factor as older people are reluctant to embrace new symbols when the old ones have been adequate for them throughout their entire lives. during the Soviet period and to reclaim the modified Latin alphabet that they had adopted in the early 1920s. Though Azerbaijan declared its independence from the Soviet Union on October 18, 1991, the BelaVezha Agreement which officially brought about the Soviet collapse was signed on December 8, 1991. Hardly had two weeks elapsed before Azerbaijan Parliament voted on December 25, to officially adopt their new alphabet. However, in truth, changes came slowly and Cyrillic was still in widespread use until August 1, 2001, when President Heydar Aliyev declared it illegal for Cyrillic to be used for any official document or on any store signage for the Azerbaijani language. Such delay in adopting the new Latin alphabet is evident on the gravestones. The general public naturally felt more comfortable with the Cyrillic, despite the desire of many of them to disassociate themselves with Russian - dominated Soviet Union. Because so much individualism was encouraged at Sofi Hamid, the impact of changing alphabets can clearly be seen in the inscriptions on the graves. On Muslim graves, there is a tendency for more uniformity and repetition of specific verses. But when individuals express themselves in a unique, individualistic way, it is clear that changing alphabets so frequently during the past 20 years has led to considerable illiteracy. Many gravestones have misspelled words and expressions that are not considered to be proper literary Azeri. Because graves always indicate dates of birth and death, it is already possible to detect trends and transitions in the nuance of beliefs. For example, now that Azerbaijan has gained its independence from the Soviet Union and freedom of religion is permitted, we see clear evidence of a growing acceptance of Islam, even during the past three or four years. More and more Quranic verses are appearing on graves. And one might add, at this stage of history, the ability of the stone carvers to emulate the difficult cursive Arabic script can be equated with a first grader, clutching pen in hand for the first time. Clearly, the scripts is not known or understood by the artist. It's obvious that each loop and dot does not carry meaning for the sculptor. Arabic writing appears as a poor imitation. Consequently, the texts are full of errors. Also fewer and fewer symbols representing the life and careers are being carved on the gravestones. If this trend continues, it is likely that photos, even the tiny small oval head shots of the Soviet period are likely to disappear. Again, this would be in accord with a more strict interpretation of Islam. In the future, it is likely that there will be less tendency to express individualism and personality. There is likely to be more uniformity and more emphasis on expressing attitudes toward death the "right way". So, it is likely that the gravestones of the future of Sofi Hamid will take on a different face. Instead of objects being carved out to depict gender, personality, interest and careers, it's likely that decorative arts will become more ornate with symmetric and geometric design. More than any academic study or analysis of this cemetery, a visit to Sofi Hamid always makes you come away with more questions than answers. It's impossible to visit Sofi Hamid without being affected emotionally. Curiously, you leave, thinking more about life, than about death; your mind filled with more questions, than answers. Staff members Gulnar Aydamirova, Aytan Aliyeva and Aydan Najafova along with Nigar Abbaszade and Rovzat Gasimov contributed to this article. From Azerbaijan International (13.1) Spring 2005. © Azerbaijan International 2005. All rights reserved.